WAR is an evergreen issue.Asked by amirani records, many musicians, each one with their own project, are here involved in the conceptual investigation of the confictual relationship among human beings. All tracks are original compositions for this goal. Amirani’s intent is to moove or provoke artists to compose and perform around social issues. Relationships and communication with all musicians involved in this adventure has been excellent and Amirani is thinking about a second volume for the next year. 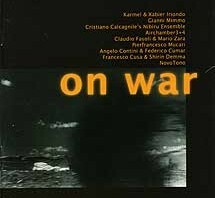 Each artist/composer/performer has been requested to explain his piece, to introduce his proceeding, to describe his way to approach to concept “War”. So in the booklet one can find an explanation for each piece directly from the musician. To extend the communication, to enhance the perspective, to create more possibilities of relations each piece has been completed with a marvellous photo by Elda Papa. War is here seen in its several aspects. Today wars are clearly without exits and seem to be self-mantaining issues. Cosmic, national, international, personal, civil, cold, holy, theatre of, nerves, to the knive W A R .